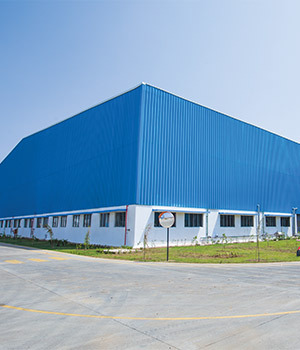 Tata BlueScope Steelis one of the largest manufacturer and supplier of color coated roofing sheets, Wall cladding sheets and roofing accessories in India. The company manufactures wide range pre painted steel roofing profiles including trapezoidal roof sheets, corrugated roof sheets,curved roofing sheets, standing seam roofing system and concealed fixed roofing systems. Tata BlueScope steel roofing sheets are manufactured from high strength pre-painted and Zinc –aluminium alloy coated steel exhibiting greater corrosion resistance, wider spanning capabilities with better uplift performance. DURASHINE® brand is the flagship retail brand of Tata BlueScope Steel for Roof and Wall cladding products. DURASHINE® brandcaters to the retail market through its wide network of distributors and dealers across India. TheLYSAGHT® brand is a premium Roof and Wall cladding brand from Tata BlueScope steel for B2B and Projects segment. LYSAGHT® brand caters to the projects market through its direct sales network and LYSAGHT Solution centres. Tata BlueScope Steel Roofing sheets are manufactured from high strength 550 MPA steel that provides greater strength and spanning capability resulting in better design freedom. Tata BlueScope Steel Roofing sheets come with a unique anti-capillary groove that ensures better performance during rains. Tata BlueScope Roofing and wall cladding sheets are manufactured with the world’s most advanced metal and paint coating technology. This oven baked paint finish resists peeling and cracking ensuring a more durable performance. 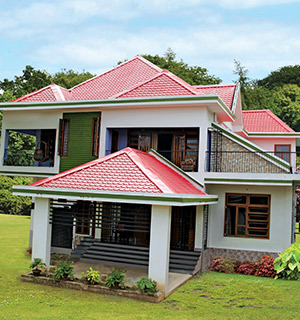 These color coated roofing sheets are available in a variety of aesthetically pleasing colours. Tata BlueScope Steel offers a wide range ofcolor coated Roof and Wall cladding products specially designed to suit your design and architectural requirements. TheseRoofing Products are manufactured from Al-productZn alloy coated steel that offers excellent corrosion resistance and lasts up-to four times more than ordinary Zinc coated steel roofing sheets. Long length, light weightroofing sheets with use of self drilling screws facilitate safe, easy and quick installation. Tata BlueScope steelRoofing sheets help maintain greater thermal comfort all year round and helps reduce heat radiation penetrating inside the building, thus making the interiors cooler. Tata BlueScope SteelRoofing sheetsare trusted for goodquality and value. Our products have abrandmark on the reverse side of thesheet that give details of the grade and thickness for easy identification and assurance of a genuine product.